2017 has started, and despite 2016 being memorable for lots of wrong reasons, I had barely got used to it! Happy New Year dear reader, and I hope this year turns out better for all of us. My main goal is not to not break any major bones resulting in a 12 week hiatus on most things – but particuarly crafting. I did manage, over the Christmas break, to complete a huge project that I had been working on most of the year for a friend. Of course it came down to the wire and I completely forgot to take photos. A challenge thrown down on St Stephen’s Day (that’s Boxing Day to most of the UK) resulted in me crocheting a hat in DK weight sequin yarn with a 3.75mm hook in a little over 3 hours. Of course I also don’t have photos of that either. 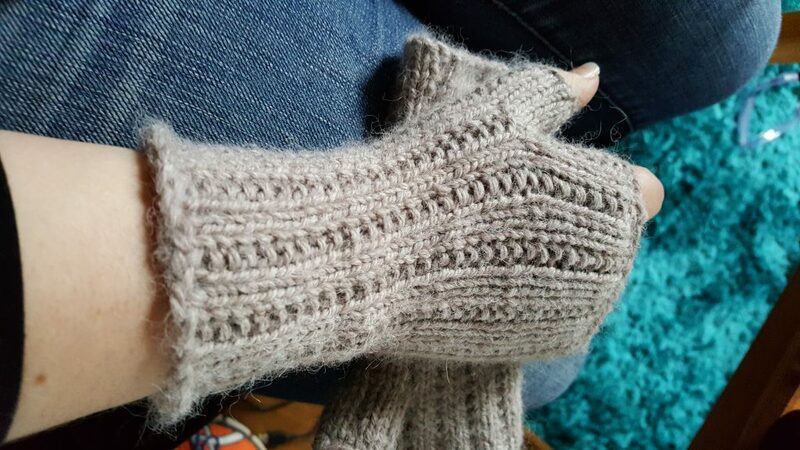 I did however manage to take a couple of photos of my ‘plane’ knitting though – and now have a lovely pair of alpaca/wool close fitting fingerless gloves. The pattern is Easy Peasy Fingerless Mitts by Make Something Special and whips up in no time (relatively) – I’m not the world’s fastest knitter by any stretch of the imagination, and these took me about 5 hours all in. So, first post of the year, and the usual promises and resolutions loom on the horizon. I’ve got lots to share with you, and big plans. Some of my break was spent with lots of sheets of paper writing down lots of ideas and plans and resolving them down into something feasible. The first resolution involves this blog. I’m a perfectionist which results in me not doing anything until it’s perfect in my head, beautifully presented, hundreds of photographs, witty and insightful, and preferably topical… which realistically is never going to happen. I’ve accepted that and so have the idea for a series of small ‘update’ posts that should (hopefully) mean that I post more regularly. I’ve even got a ‘theme’ plan for regular posts on a monthly basis which broadens the original spec of the ‘crafting’ blog, but frankly I am more than just the crafting in my life – which admittedly is a large and important part, but not the only part! The second resolution is after the confidence boost and publication of the Manchester Shawl last year I have promised to publish at least 4 more patterns this year. That involves quite a lot of work so fingers crossed. Of course there are several other non-craft related resolutions – the usual ‘lose weight’, ‘improve my second language (French)’, watch less telly, don’t get blown up by Trump…. stuff. Right, I’m posting this, imperfections and all, and moving on to working off some of the weight I’ve gained over the celebration period and the 3 months before when I couldn’t cycle to work due to a broken elbow. I’ll let you know how it went very soon! So, what are your resolutions for this year?